Body & Blood is the third book in The Survivor’s series by Amanda Havard, and perhaps if I’d read the first book or two this would have been an easier read because I would have understood the characters a little better. On the other hand, if I had read the first book (or two) I probably wouldn’t have bothered with this third book. Lots of exciting adjectives and adverbs (this reads like a film trailer), but nothing that really describes anything to a prospective new reader. Who are “the Survivors” mentioned in the description and series title? “Fresh from her first brush with mortality” and “playing human” … clearly there’s something paranormal or other-worldly here, but what? Is the answer in the book? Yes… but not too early. So those of us who have not read the other volumes, aren’t clued in very well. I felt like the book was mostly talk. The characters stood around and talked to one another – about plans, about what they would do, about how to solve their problems. Then something might happen, and they’d stand around and talk some more. This was one of the driest fantasies I’ve read in a long time. It was definitely NOT the bloodcurdling, mind-bending, heart-stopping ride I was hoping for. Looking for a good book? 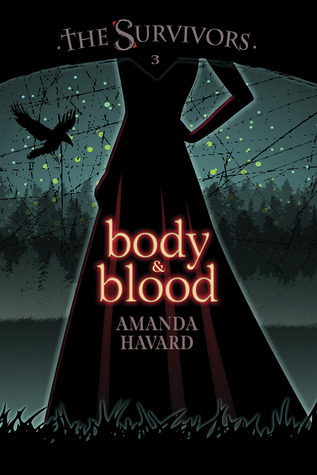 Body & Blood by Amanda Havard might appeal if you’ve read the first two books in the series … and then again, it might not.